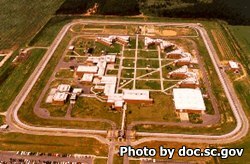 Evans Correctional Institution is located in Bennettsville South Carolina. It is a level 2 medium security facility. Inmates are housed in double bunks and are secured by electronic surveillance and a perimeter fence covered in razor wire. The current capacity of Evans Correctional Institution is 1,410 male inmates. Offenders at this facility are provided on site medical and dental services. This facility operates a private industry that utilizes the inmates to assemble electronic components. Evans Correctional Institution provides video conferencing capabilities for parole hearings in the region. Inmates at this institution can participate on labor crews that serve the parks department. Additionally, inmates can partake in the "Operation Behind Bars" program which is similar to the scared straight program, in that the inmate's share the consequences of their criminal behavior with at risk youths and adults who tour the prison. Inmates at Evans Correctional Institution can receive vocational training in barbering and computers, as well as take academic courses in literacy, adult basic education and earn a GED. Visitation at Evans Correctional Institution occurs on Fridays, Saturdays and Sundays and utilizes a rotating schedule based on the first letter of the inmate's last name. On the weekend there are two visiting sessions from 8am-12pm and from 1pm-5pm. On Fridays there is one visiting session from 3pm-6pm. The days and session your inmate is allowed visits will rotate weekly so contact the facility for the current rotation.